So many interesting textures, what are those, teeny tine\y footprints? I know what you mean about short post — I’m in the MORE, MORE, MORE pictures camp. But sometimes, one is all you need, like this one with the beautiful Veronique Vienne quote. I had a longer version of this post, but I couldn’t get it to “work”, aka, I thought it sucked and had no flow. So I decided to go simple! What a great quote and a very clever post. short and sweet with a poem describing the poetic extraordinary. Love it! Nice capture. 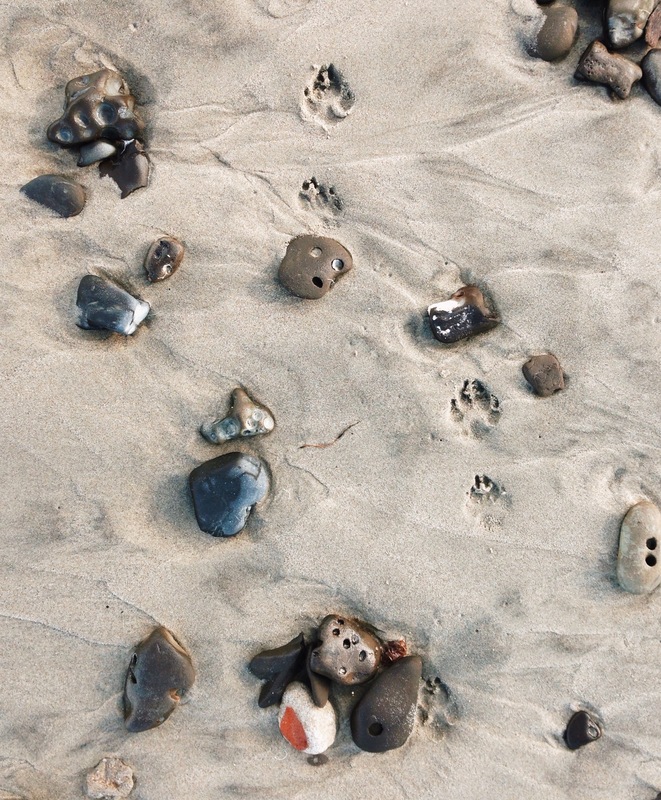 Love the little paw prints and the interesting shapes of the rocks. Thank you!! I love those elements, too! I love the beach. What an interesting photo 🙂 I like the dark black rock that looks like a heart. I’m off to your site now to see what kind of adventures you’ve been creating! I am a little behind too! Not ruined at all. Just beautiful! Love the picture. As if you have captured an range of miniature masks. But, yes, it’s always sad when the technique screws up our work.